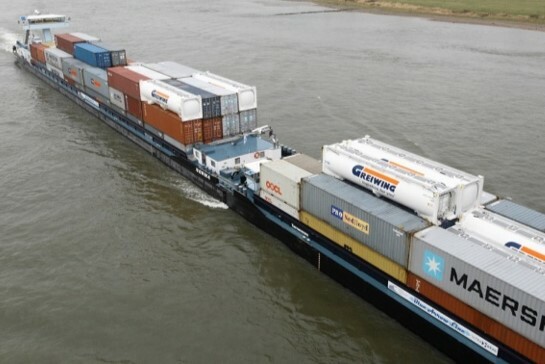 Transport by inland vessel is the most environmentally friendly method, because the inland vessel along with the train has the lowest energy consumption. The boats’ noise emissions are also minimal and the extension of waterways, unlike roads, does not require any additional landscape consumption. In contrast to the transport of mass goods such as coal, ore and gravel, however, it is not usually possible to completely avoid the use of trucks in container transport. Overseas containers loaded onto truck chassis are placed at the loading station, and can there be loaded or unloaded like conventional trucks. However: Direct transport by truck between the loading station and the seaport represents the most environmentally damaging and usually also the most expensive method. 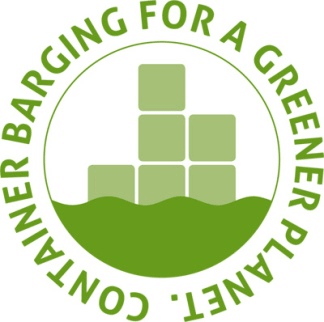 This is where our concept of “Container barging for a greener planet “ comes in. We offer you environmentally friendly multimodal transport between the seaport and your loading or unloading station inland. In doing this we use trucks only for minimal necessary transport routes between the place of dispatch or destination and the nearest inland terminal. The majority of the transport route is then handled in an environmentally friendly way with our modern container freighters or our container trains. This helps you to reduce your CO2 emissions. We provide you with the concrete CO2 emissions in kg for your multimodal shipment on every freight invoice. 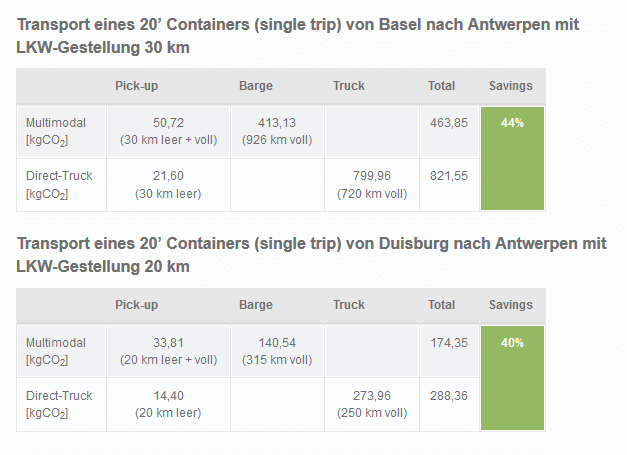 To put these values in context, we also provide a comparison with direct truck transport and the saving in per cent. Any CO2 emissions from the direct transport of goods by truck, train or ship are taken into account. In addition to the direct transport of goods by truck, train or ship, the emissions caused in the production of the energy carrier (fuel) are taken into account. This includes all levels of production and distribution from the exploitation of the oil at the borehole to the refinery to transport to the petrol station. Without equivalents: Pure consideration of CO2 emissions. With equivalents: Further greenhouse gases with environmental effects arise along with the CO2 emissions. These can be converted into CO2 emissions and then increase in the emissions factor. According to the first draft of the CEN standard (DIN EN 16258:2011) the “well-to-wheel” approach with equivalents should form the basis of calculations. Therefore we as a company also follow this approach and use the value of 3.24 kg CO2 e/l as the emissions factor (applies to gas oil and diesel). For provision one journey with empty containers and a return journey with full containers (vice versa for import) is always calculated. Distances are calculated on the basis of the current map & guide version. For the direct lorry to be taken as comparison the following transport route is envisaged: Collection of the empty container at the inland terminal – Journey to the loading station – Journey with full container to the seaport. (Vice versa for import). In addition an empty travel proportion of 20% is assumed, as it cannot be taken for granted that a connecting trip can be found at the same location. Distances are calculated on the basis of the current map & guide version. For the fuel consumption of our inland vessels we used the actual average values of the fleet from the year 2013. This value includes the total fuel consumption in relation to the tonnage transported and distance covered. This equalises differences between mountain and valley journeys and takes capacity into account. Distances are based on river kilometres according to WESKA. Source: among others DSLV guideline “Calculation of greenhouse gas emissions and logistics according to DIN EN 16258/terms, methods, examples 2nd updated edition (As of: March 2013). A standard weight of 16t per container is assumed in the quotation. In the invoice the calculation is made using the actual container weight. Following the CEN norm, handling and storage are not taken into account.